Keep Calm & Snark On : Happy Easter!! Happy Easter!!! Has been a busy Easter weekend for me, Friday had lunch at Pickle Barrel in Toronto with my bestie, Easter dinner #1 with my in laws yesterday and off to Oshawa for Easter dinner with my parents, brother, #1 phew and cousin Josh (DINNER MOOCH!!!). Before I head off I wanted to show you the Easter card / egg I got from the best little 2 year old card maker in the world...thank you Adrian!! Does he know me or what? 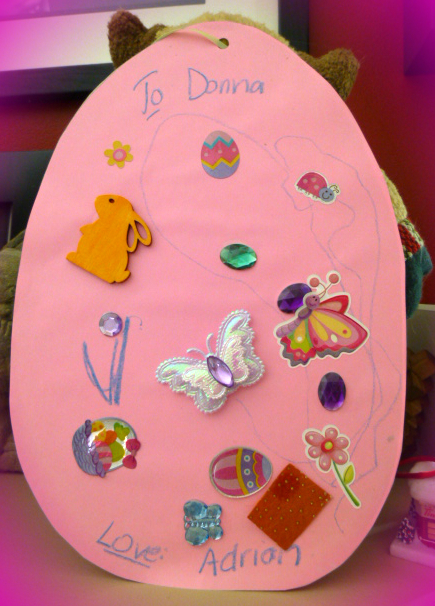 He insisted it had to be pink and have jewels! Love this! That would be forever hanging on my fridge!